Demand for the 2008 is boosting Peugeot sales. European car sales jumped 10 percent in March, the seventh consecutive monthly gain, as new models to replace aging vehicles and an economic rebound boosted demand at automakers including Renault, PSA/Peugeot-Citroen and Volkswagen. Registrations increased to 1.49 million vehicles in the EU and EFTA markets from 1.35 million a year earlier, industry association ACEA said today. First-quarter sales rose 8 percent to 3.35 million cars. Download PDF, above right, for March and three-month sales by automaker, brand and country. "The numbers for the first quarter and in particular for March are superb," said Hans-Peter Wodniok, an analyst at Fairesearch in Germany. "There will be more moderate growth in the months and quarters to come." IHS Automotive analyst Carlos Da Silva said corporate and consumer confidence has started improving, which means the recovery may be sustained but he said discounting and finance deals are still at high levels. "Part of the improvement is genuine: customers, both private and corporate, are slowly coming back into the showrooms to replace their aging cars," Da Silva said. "Pent-up demand is releasing and more new and attractive models are coming to keep luring Europeans into renewing their fleet." Deliveries are rising as consumer confidence in Europe strengthens and the sovereign-debt crisis recedes in Spain, Greece and Portugal. The European Commission is forecasting the economy of countries sharing the euro will grow 1.2 percent in 2014, following a recession that ended early last year. Volkswagen Group's European sales rose 8 percent with 5 percent growth at the VW brand, 7 percent at Audi, 20 percent at Skoda and 9 percent at Seat. New models bolstering demand include the Skoda Rapid hatchback, a sedan version of Audi’s revamped A3 compact, and the Seat Leon station wagon. PSA's registrations were up 11 percent as the Peugeot brand posted a 13 percent jump and demand at Citroen rose 8.5 percent. 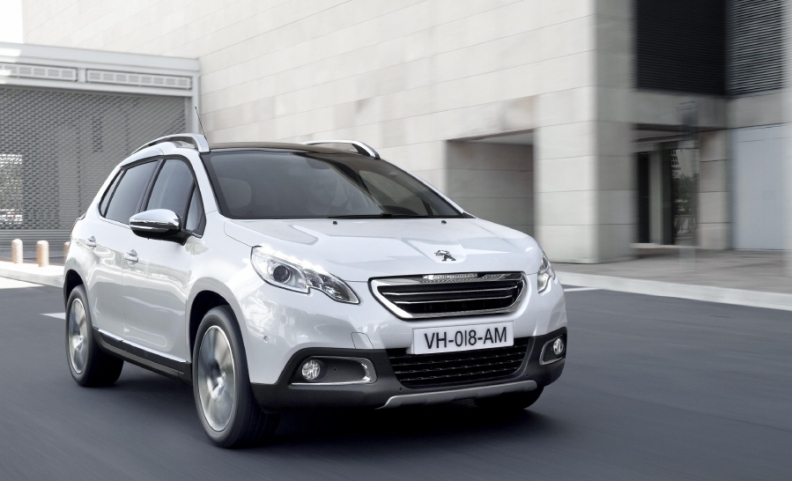 The company said this month that it will increase production of the Peugeot 2008 compact SUV after receiving 120,000 orders for the model. Renault's group sales increased by 29 percent. The automaker's low-cost Dacia brand saw sales rise by 51 percent sales increase. Renault brand's volume was up 23 percent. Ford Motor’s European sales rose 14 percent while General Motors Co.’s deliveries increased 7 percent as a 15 percent increase at the Opel and Vauxhall brands offset a 52 percent decline at Chevrolet. Demand at Fiat Group gained 4.2 percent, with the Fiat brand's sales up 4 percent, Lancia up 2 percent and Alfa Romeo down 3 percent. Hyundai’s sales in the region rose 5 percent last month, while its Kia subsidiary posted a 10 percent jump. Toyota sold 5 percent more cars. Japanese rival Nissan saw registrstions rise 15 percent. Group sales in the region by BMW rose 6 percent as an 11 percent gain at the main BMW brand more than made up for a 14 percent drop at the Mini small-car marque, which is updating its model line. Mercedes-Benz posted a 7 percent increase in Europe last month, while the Smart city-car nameplate’s deliveries fell 9 percent. Jaguar Land Rover sales fell 2 percent with Land Rover sales down 5 percent and Jaguar's volume up 12 percent. ACEA compiles figures from the 28-country EU, excluding Malta, as well as numbers from Switzerland, Norway and Iceland. Sales rose in the five biggest markets, with jumps of 18 percent in the UK, which holds second place in the region, and 10 percent in Spain, which ranks fifth. Deliveries in Germany, the largest European auto market, rose 5.4 percent. French sales rose 8.5 percent. Italy was up 5 percent. The U.K. "is really the driving force when you look at the other large European markets," said Fairesearch's Wodniok. The pickup in sales is failing to halt a price war in Europe, Reuters reported today, citing an confidential industry survey. Average retail incentives jumped 12 percent to almost 2,750 euros ($3,800) per vehicle in the five biggest markets, Reuters cited the survey as saying. The VW brand saw the biggest increase in incentives to nearly 2,400 euros per car - up by one-third but still well short of the industry average. Discounts topped 3,000 euros per Peugeot vehicle and more than 3,750 per Citroen across Germany, Britain, France, Italy and Spain. Renault kept its incentives in check at about 2,350 euros per vehicle. Opel and Ford both slashed more than 3,500 euros off each vehicle on average. According to consulting firm Dataforce, a full 30 percent of German registrations were demonstration vehicles - registered by manufacturers to their own dealers and sold as nearly new, often at a loss. By comparison, such 'self-registrations' accounted for less than 9 percent of sales in Britain and 14 percent in France. "In the wake of the 2008 financial crisis, consumers are without a doubt more value-sensitive," said Allan Rushforth, Hyundai's head of European operations. "For the moment the incentive levels are at an all-time high," he said. ISI Group analyst Arndt Ellinghorst believes European discounting pressures are about to ease, pointing to a 5 percent pickup in German used-car prices in March. "While used car prices might not be a perfect yardstick for new-car pricing, we believe it has predictive value," he said. Automotive executives are predicting industrywide European car sales, which reached a two-decade low in 2013, will expand by about 2 percent this year. "There is a big recovery coming in Europe," Renault-Nissan CEO Carlos Ghosn said on April 15 at the opening of a Nissan plant in Resende, Brazil.